In the foothills between Lassen Peak and Reading Peak, Paradise Meadows is a sheltered, marshy basin surrounded on three sides by steep, partly wooded slopes, and filled, in summer, by a profusion of differently-colored, water-loving wildflowers, growing around the upper end of a tributary of the West Fork of Hat Creek - a small stream which flows down an overgrown valley, joins the main fork and crosses the national park scenic drive near Hat Lake, from where the 1.4 mile trail to the meadows begins. 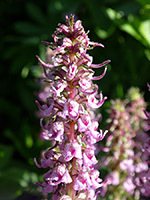 Views along most of the path are somewhat limited as trees obscure the wider landscape, but the immediate surroundings are quite pleasant, a mix of woody groves and open, grassy clearings, and here also are found many types of flowers. Perhaps because of the lack of any spectacular scenery, the route is lightly used, and so usually very peaceful. Another, even less traveled path branches off shortly before the meadows, ascending 1,000 feet towards Terrace Lake, closer to the inaccessible summit of Reading Peak, though this area is much more easily reached from a different trailhead further south along the highway. Paradise Meadows topographic map, Lassen Volcanic National Park map. 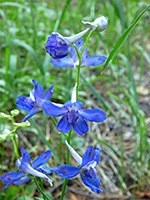 23 views along the Paradise Meadows Trail, mostly wildflowers; gallery, slideshow. The Paradise Meadows trailhead is on the opposite side of the road from the Hat Creek parking area, a sizable pullout with interpretive notices, overlooking the lower valley of the stream as it flows northwards towards Badger Mountain. Mount Lassen rises imposingly to the southwest and there are several lesser volcanic summits in view through gaps in the thick forest. All of the path encounters lightly wooded land, starting off quite level, close to but out of sight of Hat Lake, and soon passing a huge boulder on the left, one of many scattered by the 1915 Lassen eruption. The route is parallel to the creek staying a little way above, through a mixture of bushes, grassland and trees, plus many flowers, concentrated around moister areas where small streams join from the east. A few short patches of taller, denser forest enclose the path as it ascends steadily but not too steeply until the creek approaches and the gradient increases - at a boulder-strewn slope, then lessens around the junction with the path to Terrace Lake, just after a powerful cascade. The main trail ends with a short stretch through level pine woodland, to the edge of the meadows, where the creek splits several times and meanders across the boggy flats. A few tiny tributaries join from the west, while above are craggy slopes bearing some snow well into summer. 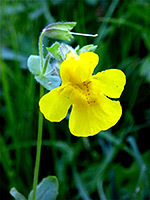 The grassland is ideal habitat for mosquitoes, and flowers, with several dozen species growing here, most small and delicate, and some on large-leaved stems, so the overall color of the meadows is a still a rich green. 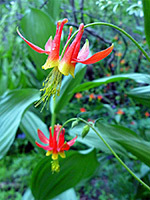 Plants include gentian, crimson columbine, orchid, lupine, onion, skyrocket, Alpine shooting star, California corn lily and elephant heads.